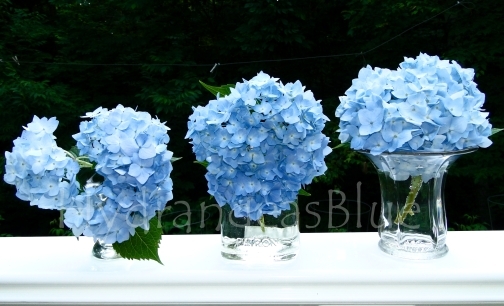 Vases with blue hydrangeas- the Endless Summer variety. It’s not too hard to fill a vase with hydrangea flowers. Generally they are huge, and one will fill any kind of vase nicely. Some of my new plants were flattened by a torrential rainstorm we had just after I planted them and they still bloomed, but the blooms are laying on the ground facing upwards. Today I decided to cut them and bring some inside, but getting them to look okay in a vase is not easy since the heads are greatly bent sideways. I brought a vase full of hot water outside with me and plopped the cut stems into it right away. That keeps the white sap from clogging the stems so the flowers won’t wilt right away. Than they are added to cold water once I go inside – snipping a bit off the bottom of the stem first. I dug out my little vases – one is actually an empty Patron tequila bottle- and filled them with the light blue flowers. I need these photos for my work as I get ready to add new wedding stationery to my BlueHyd store. Previous Post Bloom Hydrangeas, Bloom !! !